Located by the sea, this family-friendly hotel is 5.9 mi (9.5 km) from Ria Bintan Golf Club and 17.5 mi (28.1 km) from Gunung Bintan. Nestled on the beach, this Bintan resort is next to a golf course, 3 mi (4.8 km) from Ria Bintan Golf Club, and 19.8 mi (31.8 km) from Gunung Bintan. 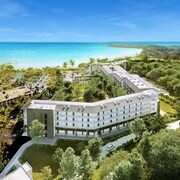 Situated near the beach, this resort is 7.6 mi (12.2 km) from Ria Bintan Golf Club and 17.2 mi (27.6 km) from Gunung Bintan. Nestled on the beach, this Bintan hotel is 10.1 mi (16.3 km) from Ria Bintan Golf Club and 19.7 mi (31.7 km) from Gunung Bintan. Nestled on the beach, this Bintan resort is next to a golf course, 3.6 mi (5.8 km) from Ria Bintan Golf Club, and 18.6 mi (30 km) from Gunung Bintan. Set in Bintan, this family-friendly hotel is 3.1 mi (4.9 km) from Ria Bintan Golf Club and 19.8 mi (31.9 km) from Gunung Bintan. Room is comfort and clean but the wifi in the room is very weak. Facility are well maintained. 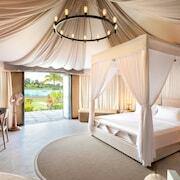 Families will find kid-friendly activities in Bintan, and visitors give high marks for the beaches and relaxing spas. This relaxing city also attracts tourists with its sporting events.